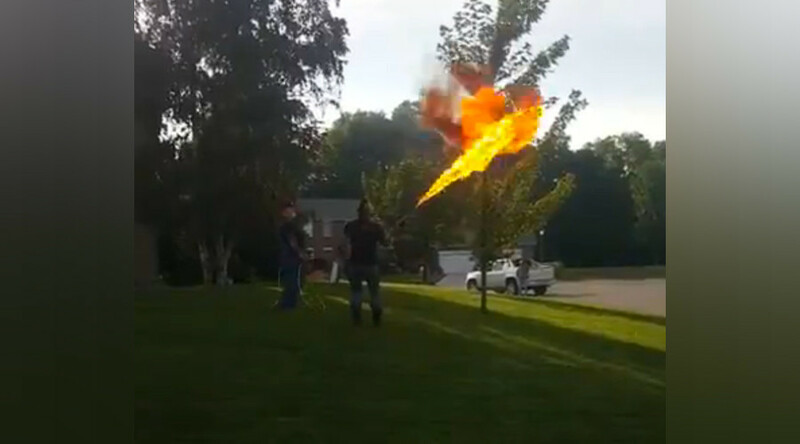 One man’s fiery solution to his pest problem has gone viral. Like a US soldier taking out a Vietnamese village, the unnamed man uses a flamethrower to burn down the hornets nest. He explains on the video that his giant human family was attacked by the tiny wasps living up in a tree on their suburban street. “Nobody messes with my family,” the man says, shortly before igniting an innocent tree with his gas-powered gun. “We don’t need exterminators. Everything is under control,” he promises his sister who is filming the scene. “That’s how you take care of the situation,” he says, after the job is done. The man then fires a few more flames at the tree, which presumably is punishment for harboring the terrorist hornets. He isn't the first, and probably won't be the last, human to resort to such excessive measures. The Chinese military was captured taking out a hornet's nest in full battle gear. ...but after his drone was damaged, he resorted to the tried-and-true fire method.